Curly in the City: MIA...not Miami! I am taking a breather today....work has been crazy, life has been busy, the gym-train is running full force (back on after a little Oct breather! ), photography class is going swell...I'll be back manana! Swear. Promise. Cuz girl, the two posts I started writting were all sorts of a hot mess....and you don't need to read my mumbo-jumbo all about nothing! Till then.....stare at these with me....are you staring yet??? Now, wish you had an extra $$$ in your wallet so we could both get a pair to call our own!!!!! (Don't worry I will still be reading your blogs and commenting....you help me pass long conference calls! ;) ) And yes I am still on a Cheetah kick! 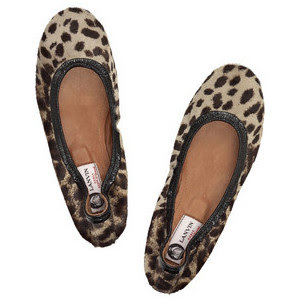 Those Lavin flats are haunting my dreams! Love them! relax! i'm staring at the flats though...gorgeous! nothing excites me more than Lanvin and Leopard! Now SURELY we can find a more affordable option. I do love those though. ugh!! those are amazing...and just seeing the word "lanvin" makes me a bit happier. damn i've got to lose the label love!